Did you know a fully ripened navel orange may, in fact, be slightly green? Increase your citrus fruit IQ with the navel orange how-to tips below. (We have similar primers for grapefruit and lemons, as well.) Once you know the essentials, you’ll be on your way to enjoying their sweet and tart flavor in everything from elegant side salads and chicken entrées to refreshing smoothies and festive JELL-O Desserts. Choose firm, smooth-skinned oranges that are heavy for their size. Avoid any with soft or moldy spots. Color does not indicate quality or freshness. Fully ripened oranges may have brown-speckled skin or turn green again. 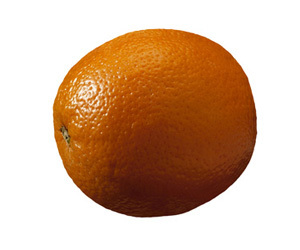 For maximum freshness, store oranges in the refrigerator, away from vegetables, for up to 2 weeks. Or, leave them out at a cool room temperature for 1 week. Wash oranges thoroughly before cutting, peeling or zesting - even if the peel is discarded to remove any wax or pesticide residues. Most of the flavor is in the peel. To grate the zest (or colored part) of the peel, use the fine holes of a grater. A vegetable peeler removes long strips of peel that can be cut into thin strips for a garnish or minced. Be careful to remove only the colored part of the peel - the white pith tastes bitter. One medium orange yields about 1 tablespoon grated zest. Before juicing oranges, bring them to room temperature and roll them on the countertop while pressing down. This breaks the juice sacs inside the fruit so that more juice is released. One medium orange yields 1/4 to 1/3 cup juice. Sectioning oranges removes the peel, pith and membranes from each orange section. This makes them more attractive and easier to eat in salads and other dishes. Peel the orange with a paring knife to remove all the peel and white pith. Working over a bowl to catch the juice, cut down on either side of each membrane and lift out the orange section. Toss orange segments into salads, a cup yogurt or top off a bowl of your favorite cereal. Substitute a little orange juice for the water when cooking rice for an added flavor kick! Float orange slices in punch bowls or perch on the edge of a drink glass. Stir grated zest into cake, muffin and quick bread batter. Or mix into softened butter for an orange-flavored spread.